"Dachs was whelped on Dec. 6, 1931 in a letter of 8 (5 males, 3 females), which included Dolch. The breeder was Mr. F. Schorling (Hanover). Dr. Roesebeck examined Dachs at the age of 22 months. From his report we can recontruct the following picture. Dachs was a tan colored dog with black muzzle and saddle and a tan and grey stripe at the withers. He was strong and of medium size, a good representative of the standard, with noble expression, good temperament and good gait. He is described as lively, alert and fearless. Dachs had strong jaws and strong, healthy teeth which met in a scissors bite. He had the harmonious proportions of a trotter, strong, medium-heavy, substantial and covered plenty of ground on standing. His forechest had good depth, his front and rear angulations were good. The shoulder blade was long and well placed and he had strong shoulder ligaments. The upper arm was long and well placed, the lower arm long and straight. The pasterns were well coupled and the paws were arched and compact. The croup was good, he had strong thigh muscles and a long upper thigh. The hind leg ligaments were strong. He had a fleeting, spacious and elastic gait and good rear drive, transmitted through a strong back." 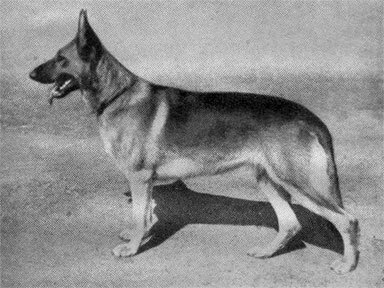 "Beautiful dog, but no hero... today he would not pass any (temperament or character) examination, would not be approved, or entered in the special book (Koerbook) as most suitable for breeding."